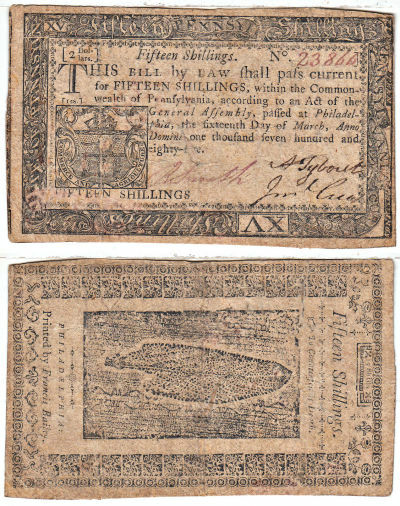 Faced with a coinage shortage, the British Colonies in North America began issuing their own paper currency in the early 1700's. 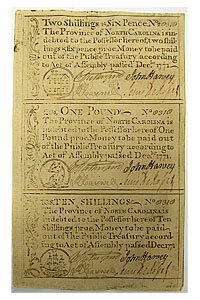 These notes were denominated first in British pounds and shillings, and later in U.S. dollars. Some early issues were printed by Benjamin Franklin; some others were signed by officials who later signed the Declaration of Independence. After independence was declared in 1776, the United Colonies, and later the United States, issued paper currency under the authority of the Continental Congress. These fascinating pieces of our colonial heritage are wonderful additions to any collection and are truly historical! 12/1771. NC. Uncut Sheet. CCU. Uncut sheet of 3 notes - 2 Shillings/6 Pence, One Pound, and 10 Shillings. A beautiful original sheet from a better colony! 3/16/1785. PA. Fifteen Shillings. VF. A very scarce issue. This is the first 1785 Pa. issue we have handled in several years.